Find an alpaca farm near you and contact them for a visit. Come meet these curious, intelligent creatures in their pastures. They are each named and often respond when called. 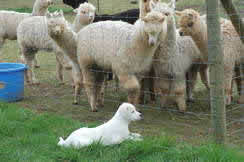 Several of our members have farm stores with alpaca products made from their herd. Shop local! "How can I own alpacas if I don't have a farm?" Many of us bought our first alpacas and boarded them at a nearby farm until we found a place of our own. Be sure to ask how we got started and why ~ you're sure to find a story close to yours! AAWO Membership is fun and affordable at just $100 per year. We invite you to come join us in this adventure!